‘A pure delight…fabulous, fun and unforgettable’ – Debbie Johnson, bestselling author of Summer at the Comfort Food Cafe ‘Jane Linfoot has got out the mixing bowl and whipped up a truly gorgeous story…A deliciously scrumptious treat' – Rebecca Pugh, author of Return to Bluebell Hill 'Just like the perfect wedding cake, Cupcakes and Confetti is beautifully crafted and wrapped in romance' – Heidi Swain Brides by the Sea, the cutest little wedding shop in all of Cornwall, has it all, including cake baker Poppy who lives upstairs. But wedding planning is not the piece of cake Poppy thought it would be, and when her best friend Cate’s wedding planner walks out, Poppy has to tie up the loose ends so her bestie can tie the knot. Double-booked venues, ‘rustic’ locations and gorgeous but grumpy farmer Rafe have this wedding pro feeling like she could be Cate’s ‘something blue.’ Will the wedding, the shop and the cake all come crashing down on her? Or will Poppy pull it off to give Cate – and herself – the happy ever afters they deserve? This is the first full-length novel in a brand new series set in Cornwall. 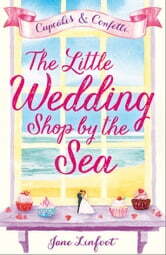 Look out for the next books in The Little Wedding Shop by the Sea series. The perfect romance to take on your summer holidays! For fans of Milly Johnson, Jenny Oliver and Lucy Diamond. I really enjoyed reading this book because in a world that's falling apart it shows us what really matters: the small things. If you're in need of a shot of optimism, read this book.